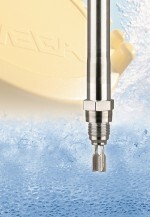 VEGA says the latest addition to its portfolio of vibrating limit switches for liquids, VEGASWING 66, is a world first. It is designed for reliable, self monitoring and fail safe switching in applications with process temperatures up to 450 °C and process pressures up to 160 bar. Until now, vibrating level switches have been limited to process conditions up to 280 °C and 100 bar. The company says by developing a revolutionary new tuning fork drive, it makes deployment of the instrument possible far beyond these limits. The resulting performance capability is reportedly impressive: process temperatures from -196° C to 450° C and pressures from 0 to 160 bar. VEGA says since it is virtually unaffected by product properties, such as changing product density and electrical properties, the vibrating level switch is very versatile. It can be installed in any orientation and supplied in lengths up to 6m.